This junior/senior level text is devoted to a study of first-order logic and its role in the foundations of mathematics: What is a proof? How can a proof be justified? To what extent can a proof be made a purely mechanical procedure? How much faith can we have in a proof that is so complex that no one can follow it through in a lifetime? The first substantial answers to these questions have only been obtained in this century. The most striking results are contained in Goedel's work: First, it is possible to give a simple set of rules that suffice to carry out all mathematical proofs, but, second, these rules are necessarily incomplete - it is impossible, for example, to prove all true statements of arithmetic. The book begins with an introduction to first-order logic, Goedel's theorem, and model theory. A second part covers extensions of first-order logic and limitations of the formal methods. The book covers several advanced topics, not commonly treated in introductory texts, such as Trachtenbrot's undecidability theorem. Fraissé's elementary equivalence, and Lindstroem's theorem on the maximality of first-order logic. This junior/senior level text starts with a thorough treatment of first-order logic and its role in the foundations of mathematics. 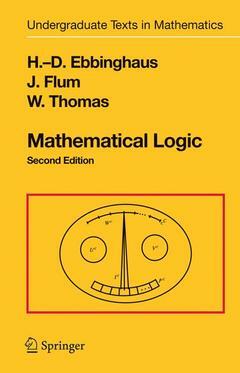 It covers several advanced topics, not commonly treated in introductory texts, such as Trachtenbrot's undecidability theorem, FraÃ¯ssÃ©'s characterization of elementary equivalence, LindstrÃ¶m's theorem on the maximality of first-order logic, and the fundamentals of logic programming.